To reduce polymerization shrinkage and increase mechanical and physical properties requires the use of high molecular weight monomers that have the ability to cross-link. The high molecular weight reduces the volume change during polymerization. Cross-linking forms covalent bonds between the polymer chains, resulting in a dramatic increase in modulus and reduction in solubility . 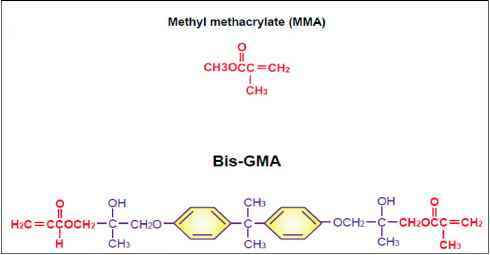 Bowen's resin is the reaction product between Bisphenol A and glycidyl dimethacrylate. A lower molecular weight monomer such triethylene glycol dimethacrylate (TEGDMA) or EDMA is added to reduce the viscosity and allow increased filler loadings to be used. These monomers are also multifunctional and increase the number of cross-linking reactions during setting of resin matrix. These lower viscosity monomers may comprise 10% to 50% of a composite's composition. One of the most significant problems with current monomers used for direct composite restorative materials is the shrinkage that occurs during polymerization. Currently, all commercial dental composites are based on vinyl monomers polymerized using free radical initiators. Conversion of these monomers results in a decrease in distance between the molecules, from a Van der Waals gap to the distance of a covalent bond. Although this distance is very small for a single monomer, the distance change over a long polymer chain is significant. Inclusion of filler reduces the volume of resin and its volume change, but the amount of filler incorporation is approaching the maximum theoretical packing fraction of 74 volume % for close-packed structures. The amount of shrinkage is controlled by the volume of resin, its composition, and the degree of conversion. Current commercial dental composites have a volumetric shrinkage ranging from 1.6 to 8 volume%. The contraction stress developed at the margin of the restoration can be sufficient to overcome the bond strength of the bonding system, resulting in a contraction gap. The contraction gap can lead to microleakage and all its associated problems (eg, secondary caries and pain) [55, 57]. One approach to reduce polymerization shrinkage and contraction stress is through the development of low-shrinkage or expanding monomer systems. These resin systems are based on ring-opening polymerization reactions that do not shrink to the extent of conventional vinyl polymerization resins. Monomers based on spiro-ortho carbonate have been prepared and evaluated in composite formulations. Although the composites formulated using these monomers did show less polymerization shrinkage, the property improvements were only incremental, and probably not significant enough to be realized clinically [10, 25, 55, 57]. One problem that has not been addressed is the large difference between the Coefficient of Thermal Expansion (CTE) of resin composites and tooth structure. The CTE of tooth structure ranges from 9 to 11 ppm/_C, compared with 28 to 50 ppm/_C for dental composite restoratives . The differential expansion and contraction of composites cause additional stress at the margin of the restoration that contributes to fatigue failure of the bond between the composite and tooth structure. Currently the only way to lower the CTE of composites is to increase the filler loading.